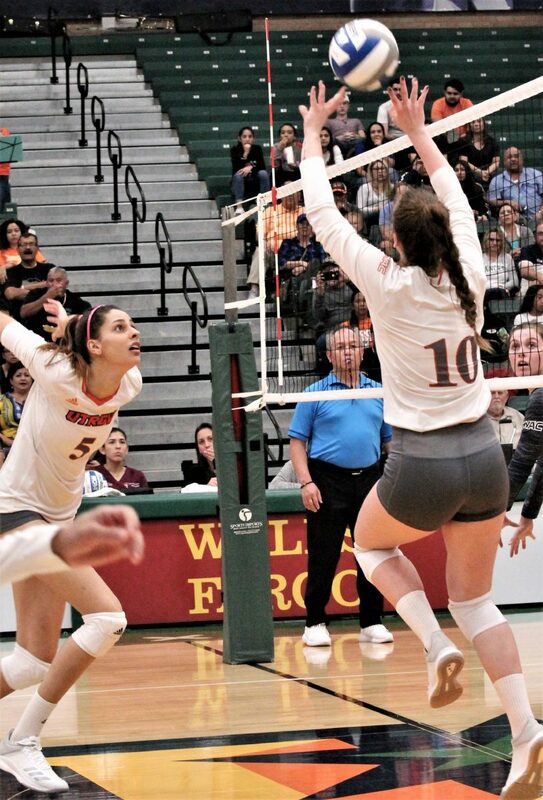 EDINBURG — Antonela Jularic may have had two of the most crucial serves to date for the UTRGV volley-ball team. Playing in the fifth set of Thursday’s WAC matchup against visiting California Baptist University, the senior outside hitter from Croatia scored on four straight service points, including two aces, and turned a 6-6 tie into a 10-6 lead as the Vaqueros claimed a drawn out 25-22, 25-14, 20-25, 24-26, 15-11 victory. The win, the team’s sixth straight, improved UTRGV to 20-8 overall and 11-3 in the WAC, still holding on to a half-game lead after Kansas City University won its match, as well, on Thursday. The two teams play in the regular-season finale Nov. 17 at the UTRGV Fieldhouse. UTRGV's Alexandra Ecker goes up for a block against California Baptist's Sydney Marks during their WAC volleyball match Thursday at the UTRGV Fieldhouse in Edinburg. UTRGV won the match in five sets. UTRGV setter Dubravka Vukoja puts up a quick set for middle hitter Talita Oliveira during their match against California Baptist at the UTRGV Fieldhouse in Edinburg on Thursday. UTRGV won the match in five sets. UTRGV only had one ace through the first four-plus sets before Jularic hit two unreturnable balls, finding a spot in the defense where the player was sneaking up, almost challenging Jularic to serve deep. She did, and UTRGV came back from a 5-3 deficit earlier in the set to claim the win, outscoring the Lancers 12-6 the re-mainder of the game. The Vaqueros were down 5-2 in the deciding set, before Silva hit a devastating kill that nobody had a chance to even move for. That started UTRGV on a convincing 7-1 run, including Jularic’s run. Lowery said the key to California Baptist extending the match was better passing. That made the offense run quicker and put the Lancers on the attack more than on their heels. When UTRGV won the WAC conference tournament in 2016 and played in the NCAA tournament, the Va-queros were ranked 123rd nationally. Going into Thursday night’s matchup against California Baptist University, the Vaqueros not only were in first place by a half-game in the conference with three home games left on the regular season, but they were ranked 85th by the NCAA women’s volleyball RPI. UTRGV won the first two sets, but came out sloppy early in the second set and trailed 9-7 following an at-tack error and a pair of double hits off sets. Senior libero Gyzell Zayas, who recorded her 1,000th-career dig in the third set, made a spectacular reflex-ive one arm punch to pop the ball up off a Lancers kill attempt, setting a perfect pass to Dubravka Vukoja who set Knudsen for another kill and the 14-9 advantage. California Baptist wouldn’t recover from the run, and the Vaqueros went up 2-0 with a 25-14 final. 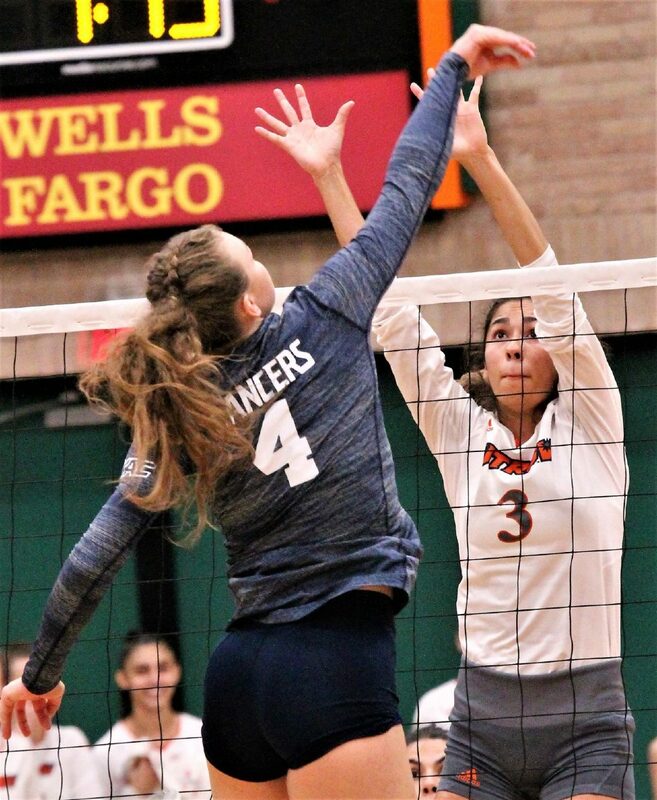 UTRGV captured the first set, trading points for most of the match with the visiting Lancers, holding a one- or two-point lead throughout until California Baptist grabbed a 20-19 advantage and Lowery called a time out. Knudsen followed the time out with a kill, CBU countered with an attack error and then tied it with a Megan Sester kill. The Vaqueros, though, remained calm and methodical in their attacks. Alexandra Ecker scored on a quick set from Vukoja, Silva added a kill and then CBU ended the game with an attack error for a UTRGV victory. The Vaqueros return to action on Nov. 15 against Chicago St., which they swept on the road earlier this sea-son.